It seems no one is safe from the oncoming Secret Wars event. 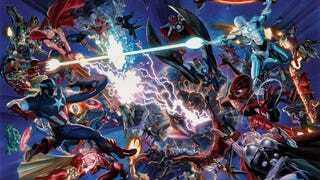 Marvel has revealed a swathe of titles will end as the event comes to a close, including some pretty major casualties like Captain Marvel, All-New Captain America, Guardians of the Galaxy and more — and not all will return. Some may take a hiatus for a month or two (something the industry is accustomed to); some will reach their "616 finale;" some become Battleworld transformed; and still others…well we'll get to those! Here's the complete list of titles that will end. Hoo boy, that's a lot of disappearing comics! Now, don't start panicking just yet. It's very obvious that a lot of these books will return: overwhelmingly popular series like The Amazing Spider-Man, the new Thor and X-Men are basically all but guaranteed. Captain Marvel is not just a big seller for the company but also on the cusp of becoming a movie franchise for them, and Ms. Danvers would be a shoo-in to return even if Marvel hadn't already announced a new Captain Marvel and the Carol Corps in June. Other obvious candidates include series with movie tie-in hooks like Guardians of the Galaxy or Avengers. But from a logistical point of view, not all of these series will survive the rebooting of Marvel's comic book universe — understandably it would be nigh on impossible for Marvel to get the clean slate they want while continuing to pump out such a vast number of series. If some of your favourite, more niche Marvel ongoings are on this list, start preparing for a chance that they might be gone for good.